HARELBEKE, Belgium (VN) — To be sure, Ghent-Wevelgem will be awful. It’s just a matter of how awful, how cold, how wet, or how snowy. There is a chance of accumulating snow in western Belgium Saturday and into Sunday, though it’s not clear how much will fall and stick, or its affect on the race. Officials have said they would cancel the race if it’s snowing hard at the time of the start — they don’t want another Milano-Sanremo — but recent forecasts are slightly better in racing’s favor than early projections. The latest forecast calls for a 50-percent chance of snow on Saturday, up to a couple of inches across Belgium, and a mostly cloudy day on Sunday. In the event it does snow, race organizers have a host of plans in place before canceling what would be the 75th running of Ghent-Wevelgem. The race dips into France briefly, and French laws mandate that any re-routing be noticed two full days in advance — something organizers may not do. They may cut the French Casselberg climb if necessary, or eliminate a trip into the country all together. French and Belgian officials also plan to salt roads early to help alleviate the snow’s effects, and snow removal equipment will also be dispatched if necessary. On Saturday afternoon, race director Frank Hoste (the 1984 Tour de France green jersey winner) will drive the course to consider its state. Clearly, officials are urgent to run the race, and there is no greater evidence than this: Ghent-Wevelgem president Luc Gheysens’ wife went to a chapel to light candles. This much, though, is clear: It will be cold, no matter what. The high temperature Sunday will be in the mid 30s Fahrenheit, with a low of about 25 degrees. If any moisture falls, it will be enough to slicken the cobbles on the steep climbs and put a deep chill into the peloton. Though the northern classics are traditionally regarded as hardman brawls in the cold, the prolonged cold in Belgium is abnormal for this time of year. Ghent-Wevelgem (which actually now starts in Deinze) began as a junior race in 1934, but is now viewed as a major win on any rider’s palmares. (It switched to a professional race after the second World War). 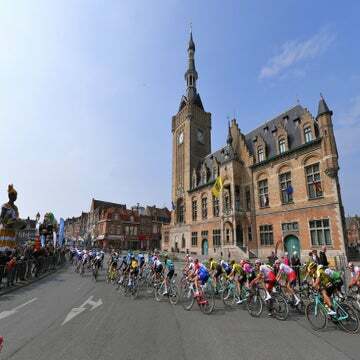 On the Sunday between Milano-Sanremo and the Ronde van Vlaanderen (Tour of Flanders), it comes during the time of the season that everything feels big, riders still feel new, and form is sharp for the men hoping to win Flanders a week later. It isn’t a monument, but its results sheet looks like it is. Eddy Merckx and Jacques Anquetil have both won it, as have Bernard Hinault, Francesco Moser, Sean Kelley, and Mario Cipollini. It’s been called a sprinter’s classic due its flat finish, but a drag race it’s anything but: there are 10 steep climbs, or bergs, spread over its 235.5 kilometers, and it climbs the storied Kemmelberg, the tallest of the West Flanders hellingen, which was contested in World War I, twice. The rough stuff is a stretch of cobbles nearly 1,000 feet in length, with grades of 22 percent. And while the final climb comes more than 40km from the finish line, the lumpy parcours will have softened legs and thinned the bunch. The Belgians have dominated this race, with 48 total wins of the 74 previously on offer. The Italians are a distant second, with six wins in Wevelgem. Favorite son Tom Boonen (Omega Pharma-Quick Step) has won the past two editions, with Bernhard Eisel (Sky) taking the race in 2010. His now Sky teammate Edvald Boasson Hagen won with High Road in 2009. The race is a vastly different affair than Friday’s Harelbeke, more likely to end in a fast group finish. But that is, of course, if there’s a race at all.